Super Easy Pallet Sign! - A Loved Lived Life A Loved Lived Life: Super Easy Pallet Sign! Building a pallet sign is so simple and easy- I can't see why you wouldn't just make one instead of buying it. Mrs. Awesome and I have seen signs of a similar size selling in boutique shops for over $50! And well, us being us, we wanted to create something which was unique to us. Begin by cutting the planks from the pallet. If you want a longer sign, you can use a pry bar to try and work the boards off the cross pieces. Once you have the boards free, arrange them horizontally or vertically, depending on how you want the sign to hang. Decide which pieces fit best where. 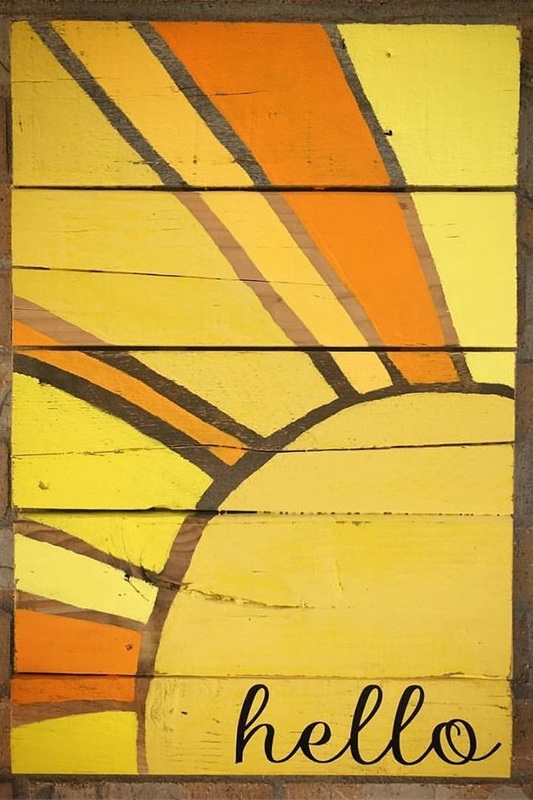 An old, weathered pallet will have a beautiful patina which you can use to enhance the beauty of your sign. If you are going to give your sign a shape, some boards long, others short or the tops cut at an angle, whatever it is, lay it out and cut the boards to shape. Once that's done, you'll lay them out face down on a solid surface, making sure to reverse the order of the boards. The leftmost face up becomes the rightmost face down. Figure out how long each pine cross piece needs to be, leaving an inch or so from the edges and cut 2 to length. Place each cross piece where it needs to be and using a screw, screw each board, from the back through the cross piece into the pallet wood. Using a length of scrap wire wrap it around two of the screws to make the mounting wire. Decorate your sign however you want! 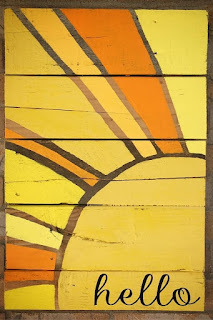 We used acrylic paints, a vinyl stick on and a few coats of satin polyurethane to finish the "Hello Sunshine" sign. This is a great project to do with your loved ones to enjoy your Loved Lived Life!